Driven by a desire to combine 20+ years brand-building experience with positive social impact, Bridget Russo joined Shinola in 2012. 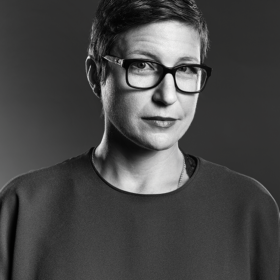 As Chief Marketing Officer she oversaw global marketing and communications for the brand, working closely with internal and external partners, across private and public sectors, to build an American design brand through storytelling and products that are built to last. A dyed-in-the-wool New Yorker, Bridget relocated from Tribeca to Detroit in 2013, where she oversaw Shinola’s marketing efforts from the company headquarters since the opening of its factory doors in the historic Argonaut Building. Prior to Shinola, Russo made a name for herself in the fashion industry by pursuing projects she found ethically compelling—including the establishment of her own consulting firm, Passion Projects Consulting, whose focus was fashion ventures driven by social impact. This globally inspired mentality began with her work at EDUN, the apparel brand founded by Ali Hewson and Bono with a commitment to reducing poverty in Africa through trade. Bridget was also named one of the Ad Week Brand Genius Class of 2016, bestowed upon 10 of marketing “most talented” that year. She also sits on the Advisory Board for the furniture brand Floyd Detroit, and is an Endeavor Detroit Mentor as well as sits on the Executive Advisory Board for TechWeek (Detroit).